Evergreen; growing in coastal California and coastal Oregon; leaves alternate, simple, unlobed, leathery; acorns enclosed at base in spiny (not scaly) cup. 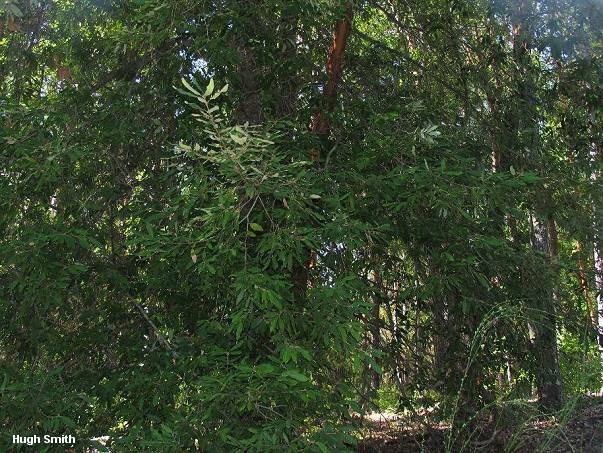 Note: Both tanoak and coast live oak are victims of Sudden Oak Death; tens of thousands of California trees have died as a result of the pathogen Phytophthora ramorum, a fungus-like organism. See the California Oak Mortality Task Force for more information. Habitat: Usually on moist but well drained soil; often mixed with other coastal trees (redwood, Douglas-fir, coast live oak, etc. ); coastal California and coastal Oregon. Stature: 70-90 feet high; to 3 feet in diameter; with a rounded crown and upward-angled branches. 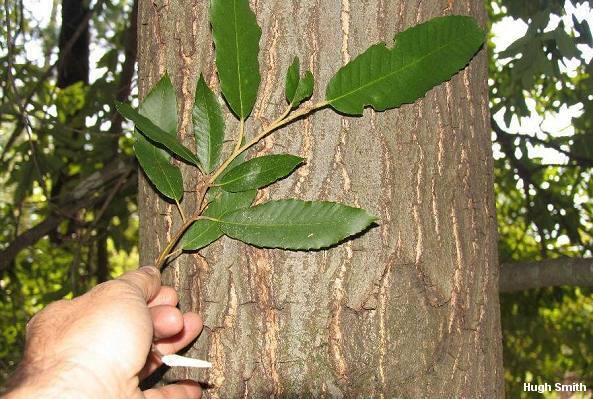 Leaves: Evergreen; leathery; 3-5 inches long; alternate; simple; unlobed; veined; toothed; pale green and smooth above; brownish green below. Bark: Thick; reddish brown; furrowed or scaly in age. 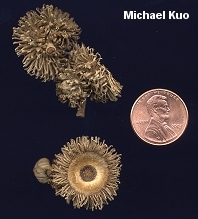 Acorns: Bitter; to 1 inch long; oval; enclosed at the base in a characteristically spiny (not hairy or scaly) cup. Agaricus hondensis; Boletus species; Cantharellus subalbidus; Cortinarius cotoneus; Craterellus cornucopioides; Entoloma bloxamii; Hygrophorus russula; Lactarius argillaceifolius var. megacarpus; Lactarius rubidus; Pleurotus ostreatus; Tricholoma saponaceum; and many others.